There are only so many things you can say to embody purpose. As part of our Retail Banking Experience data stream we’ve been looking at this area through what we believe is a new universal lens: that of the drivers of human happiness. So for marketers, the question becomes is our brand and message tapping into these key drivers? After all, what is a brand for, unless to make people happy – or at least, not miserable. And does the reality of the brand experience reflect that aspiration? As a summary, there are a number of drivers, across a spectrum from fleeting hedonic fun, through quality of life and agency, to deeper ‘eudaemonic’ happiness – a sense of feeling fulfilled. But in this blog we wanted to highlight just one aspect, and show how it relates to banking: cultural affinity. After all, banks perform pretty well in terms of getting the basics right, delivering service, and broadly keeping your money safe. They deliver good tactical products and offers. Yet, ultimately they are banks. So how can they try to differentiate and establish themselves in territories offering higher meaning? We’ve found that it’s clear many banks are now converging around variations on the theme of human relationships, social good, and investments in causes, all in the pursuit of purpose. Lloyds are by your side. Barclays will ask you to ‘go forward together’. But notwithstanding that, the stars of what we term ‘cultural affinity’ – for different reasons – are Nationwide and First Direct – ‘standing for something’ and ‘helping people fulfil their goals’. We found Nationwide stands in a unique position – ‘building society’ – and it reinforces this advantage through experiences from campaigns through to in-branch experiences. Nationwide is best in class on a number of fronts, and is one of the few players in the market seen as having a reason to exist beyond just making money. Its clever ‘building society’ message lands well. Nationwide is now a very dangerous competitor to the big five for this very reason. Yet whilst First Direct is held in affection – and remains perceived as one of the most innovative players - it does not create a high volume of relevant and reinforcing experiences, and nor is it high in the consideration set. This perhaps is a barrier to growth: a vague perception that First Direct stands for something, but that something does not translate to the day-to-day. Co-operative is appreciated for their overtly ethical positioning. But for some the brand is damaged by difficulties through 2017, and it’s clear that many people aren’t aware that it is no longer part of the Co-operative movement. But in many cases, we see the push towards purpose has yet to translate into true brand meaning. There is continued cynicism around social trust, and concerns about the inauthenticity of some brands – for example, First Direct’s parent HSBC. Again, they are seeking to communicate a sense of relationship and ‘advancing together’ – but it isn’t quite landing. By looking at experiences holistically, we find many instances of customers struggling to reconcile positive messaging with recurrent news about institutional misbehaviour or branch closures. All these trends speak to the need for banks to create a sense of relationship and wider purpose in a different way. But the financial crisis still casts a long shadow. All of these initiatives connect with people at a deeper social level: doing the right thing by society. It’s something that Nationwide has baked in; it will be interesting to see how the other big players evolve to build deeper brand meaning. Meanwhile, there is no doubt that challenger brands are gathering momentum – capitalising on a different kind of purpose altogether, the desire for change. Whilst small individually, collectively the likes of Atom, Monese, Monzo, Tandem, Virgin Money and Metro Bank are starting to make life interesting for the bigger banks, increasing their share of experience month on month. This is just a brief flavour of the richness of the retail banking experience data stream. So if you want to monitor yours and your competitors’ performance, why not talk to us about our Retail Banking Experience Landscape Report? 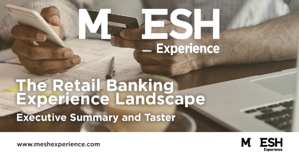 Download our Retail Bank Experience Landscape Exec Summary for FREE to learn more.